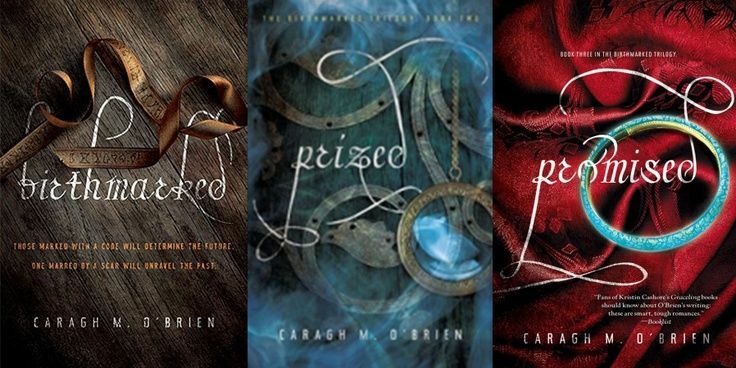 Today's review features Birthmarked, Prized, and Promised by Caragh M. O'Brien. Birthmarked is yet another trilogy set in a dystopian future (are you surprised? ), yet it has many differences from the others that are popular right now. 16 year old Gaia Stone is a midwife in her community outside the wall of the Enclave. It is Gaia's duty (as well as her mother's) to advance a certain quota of babies born each month into the Enclave so that more suitable parents may raise them and they will have a better life. Gaia's family, never ones to cause problems and always ones to agree with everything the Enclave demands, is arrested while Gaia is not home, so when she returns, she has to inquire from a family friend about what happened to her parents. Gaia, determined to get her parents out alive, heads into the Enclave to rescue them, and that is where the fun begins. She sees things she does not want to, and she becomes a pawn in the life going on inside the Enclave. Gaia befriends one of the guards from the Enclave, and together, they must escape to save themselves when they don't think anyone else can be saved. Gaia is a strong female character, and she challenges the beliefs of others. THE REST OF THIS POST CONTAINS SPOILERS FROM THE FIRST BOOK, BIRTHMARKED. When Gaia escapes from the Enclave without Leon, she doesn't know what to do. She has her baby sister, Maya, with her, and together they make it most of the way through the Wasteland. One day, when they probably wouldn't have made it much farther on their own, a man on a horse helps them reach their unknown destination, a place he calls home. That home is known as Sylum, and the rules are strict. Gaia must submit to the authorities, which she finds difficult. There is no hugging/kissing because it is a crime unless you are married to that person. Gaia finds the entire place to be a struggle, and then she finds out that Leon has made the trek as well. What does Gaia need to do in order to make things go her way? It turns out that everyone else recognizes her as a strong leader, and they want her to be the Matriarch of the society. Does Gaia want it, though? What happens when she is forced into something she doesn't know if she is ready for? Are her feelings for Leon strong enough, or will she waver and fall for someone else? Overall, these books were fun to read. I read them while I was still teaching 8th grade, and that made it easier to read so many dystopian novels. I needed to be "caught up" so I could talk about them. I'm kind of over the dystopian scene now... at least for a while. I need some fresh air! Do you like dystopian fiction? Ooh this sounds interesting! I'll have to add it to my list. I have not read this series. Sounds interesting. I actually have not heard of these books before, I'll have to look into them! Thanks for sharing!